"It's hard to impeach somebody who hasn't done anything wrong and who's created the greatest economy in the history of our country," Trump told Reuters in an Oval Office interview. "I'm not concerned, no. I think that the people would revolt if that happened," he said. Impeachment requires a simple majority to pass the House of Representatives, where Democrats will take control in January. But removal of the president from office further requires a two-thirds majority in the Senate, where Trump's fellow Republicans hold sway. 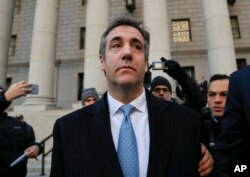 Michael Cohen walks out of federal court, Nov. 29, 2018, in New York, after pleading guilty to lying to Congress about work he did on an aborted project to build a Trump Tower in Russia. "Michael Cohen is a lawyer. I assume he would know what he's doing," Trump said when asked if he had discussed campaign finance laws with Cohen. "Number one, it wasn't a campaign contribution. If it were, it's only civil, and even if it's only civil, there was no violation based on what we did. OK?" Asked about prosecutors' assertions that a number of people who had worked for him met or had business dealings with Russians before and during his 2016 presidential campaign, Trump said: "The stuff you're talking about is peanut stuff." "I haven't heard this, but I can only tell you this: Hillary Clinton — her husband got money, she got money, she paid money, why doesn't somebody talk about that?" Trump said.